Yesterday, General Motors shocked the business world with news that despite strong profits as of late, it will close several North American plants and lay off some 15,000 workers as part of a massive restructuring. There’s a theory that if GM just made better, segment-leading cars it wouldn’t have been put in this position—but the problem is that the product alone does not equal customers. First, it’s important to remember that there are a lot of complex reasons for these cuts, which are happening at a time when GM is relatively healthy and not struggling like it was a decade ago. Demand for small cars and sedans is a shadow against trucks and crossovers. Gas and credit are cheap right now, leading customers into bigger and more expensive vehicles. GM wants to invest more heavily in autonomy and electrification, and it needs money to do that. It’s predicting, as many are, an economic downturn in 2019. And it faces costly metal tariffs and an uncertainty over a possible U.S. trade war. Still, one must wonder: If GM built better cars, would it need to do this cutting at all? The automaker’s products are vastly better than they were a decade ago, but it’s hard to find areas (besides huge SUVs like the Suburban) where GM makes a class leader. One need only look at Cadillac’s recent struggles to find examples of that. Buying a car is not a rational purchase. We know this. People don’t take a cold and calculated approach to buying or leasing the car that provides objectively the best value in the segment. There’s a lot of history and psychological connections associated with this purchase. It may not be logical or fair, and it’s grating to say, but the power of the “brand” has a lot to do with whether or not a customer chooses one car over another. This is where Chevrolet, Cadillac and the rest of GM often find themselves at a severe deficit. The “brand” didn’t resonate with customers of small cars, sedans, and luxury models. We know that trucks and SUVs are a different ballgame. Folks were shocked when Ford decided just to stop making compact cars and sedans and instead focus on crossovers, trucks and SUVs. The exception to that rule was the Mustang. Why? Because the Mustang brand still has power and value. As a professional car shopper, I talk with hundreds of car buyers every year. In 2018 alone I’ve helped more than 400 clients find new cars. I’m not throwing that number out there to impress anyone, just to offer up as a sample size. Of those 400 car buyers, only a handful of them requested help with a Chevrolet Volt. None of them mentioned any interest in the rest of the cars that are currently on GM’s chopping block—the Impala, CT6, Cruze and the rest. Sales figures back this up too. 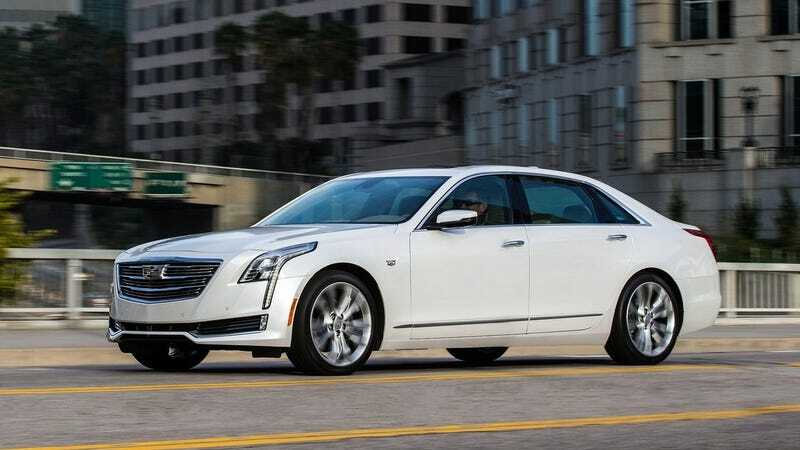 Though GM recently stopped reporting monthly sales in favor of quarterly ones, the most recent report released in October shows deliveries of the CT6—a critical darling on this website and at other automotive outlets—are down 11 percent year-over-year. The Volt is down 14 percent, the Impala down 13 percent and the Cruze down a staggering 27 percent. Granted, small car and sedan sales are down across the board. Even strong-sellers like the Honda Accord are feeling the sting right now. But none of those GM cars were segment leaders, and they got stung harder than most. Why? I see it as a perception problem for GM’s cars that aren’t trucks and SUVs. The vast majority of the car-buying public seems apathetic to GM’s car lineup. The opposition I encounter usually comes from historic baggage, where GM basically churned out crap to make sales. For decades GM’s cars were way behind the competition in regards to quality—I bet almost every one of you has a story about a bad GM car that you owned or a friend or family member had. Even in the stronger-selling segments, I’ve seen this. People aren’t excited about a Chevy Equinox, but hey, they can get zero percent APR for 72 months, so it’s cheaper than a Honda CR-V.
Of course, the same could be said for any of the domestic brands, but Fiat Chrysler and Ford saw the writing on the wall and bailed out of those segments, where GM said it would stay in it for the long haul. That was three months ago. Look how things change. General Motors knows all too well the battle for customers is not about the vehicle itself but the psychology. Just look at those “Real People” ads. The conclusion to every commercial is some “regular person” exclaiming “Wow, Chevrolet actually makes a nice car? I didn’t know that!” The subtext here is that people still have a bias against domestic cars thanks to decades of bad experiences. It’s a brutal self-own, and GM may not even realize it. Because if we are going to be “real” for a moment and talk about segments that actually sell, most buyers aren’t excited to buy an Equinox over a CR-V or RAV4, but because GM can be more aggressive with rebates, discounts, and financing those domestic crossovers are cheaper and provide a value option compared to the imports. I’ve mentioned the Chevrolet Bolt as an alternative to folks waiting on a Model 3 and the response I’ve gotten a few times is “Yeah, I don’t know if I could drive a Chevy.” That’s unfair, as the Bolt is largely very good, and unlike the Model 3 it actually costs $35,000. Same goes for Cadillac. Our own writers here at Jalopnik, having long been impressed with the driving dynamics of the ATS and CTS, are generally met with blank stares from buyers when they suggest people buy one over a comparable Audi or Mercedes-Benz or BMW. To a whole generation of buyers, a Cadillac was the unreliable land-boat they drove in college after their grandpa died and they needed a car. In so many ways, GM is still paying for decades of its bad decisions today. On the opposite end of the spectrum, you have Tesla. Despite well-documented quality control issues and questionable production practices, the Model 3 is an excellent car and carries hype with buyers that GM could only dream of. Because the car doesn’t exist in a vacuum—people buy the brand. It’s crucial to remember that even if you do make good cars—the best cars, even—you can still go out of business. Maybe you’re too leveraged on export sales and currency fluctuation screws you, or or your production is so convoluted that you’re losing money even on extremely good, expensive vehicles. Both have happened to Mazda (making great cars cut down by the economic crash of the early 1990s) and Porsche (making excellent air-cooled 911s so inefficiently it couldn’t make money off them until Toyota stepped in). But the lack of excitement and class-leadership is a factor in GM’s current state. The tragedy of all this, of course, is that the workers bear the brunt of these decisions. Tens of thousands of people will be unemployed over brand perception, tariffs, and market shifts. GM needs to reinvent itself and prepare for a future of EVs and autonomous vehicles, while still making money on the vehicles that actually sell, which right now is SUVs and trucks. The question now is: What can GM really do in this new era it’s entering to become more than just a maker of also-ran cars? GM has had a unique track record of EV innovation, having both given America its first great modern EV and also killing it. It’s also claiming to be taking the shift to autonomous transportation rather seriously—although as Lawrence Ulrich at The Drive pointed out, it’s curious that the powerful Super Cruise semi-autonomous system is only on the CT6 for now, and it’s optional, and GM is killing the CT6 within a few months as part of this pro-innovation push. And while GM pitches itself as investing in electrification and semi-autonomous tech, it’s the Volt and the CT6 that are on the chopping block, those being GM’s among biggest production forays into electric drive and driver assist systems. Still, if GM positions itself as a company that provides both innovation and value for consumers, the bad taste in everyone’s mouths could go away eventually.